The Grand Canyon is one of the most impressive natural wonders of the world. It draws in visitors from all over the globe. 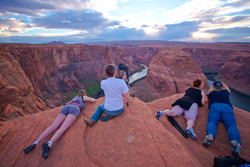 Many come simply to see it, say they've been there, grab a snapshot of them on the edge, and then they're off. 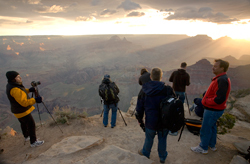 They don't spend any time in the area surrounding the canyon to see that the Grand Canyon is far more “Grand” if you spend some time exploring the area seeing more of the other out of this world landscapes that are the norm in the American Southwest. 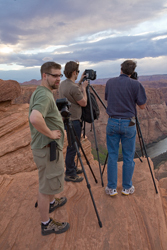 An eager group of 14 photographers arrived on a Friday in April to meet Aperture Academy Instructors Brian Rueb and Kevin McNeal and break the mold. 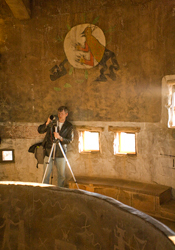 They came to photograph the area, learn from professionals, and have a lot of fun doing it. Orientation went off on time, even though the airlines did their best to keep our instructors out of Arizona. The orientation was a great place for the group to get to know one another, for returning students to reacquaint, and for the instructors to get to know the class and what it was they wanted to come away with during their weekend together. Students come with a variety of interests, skill levels, and educational goals, and it's always our priority to try and cater to those as much as possible. During the orientation instructors cover safety concerns, dress for the weekend, routes, and weather conditions. Once that is done it's time for the group to disband and get some sleep. 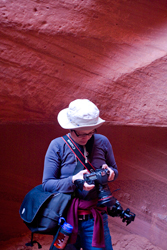 Departure time was 6:30am, with our first stop of the day being the Antelope slot canyon. 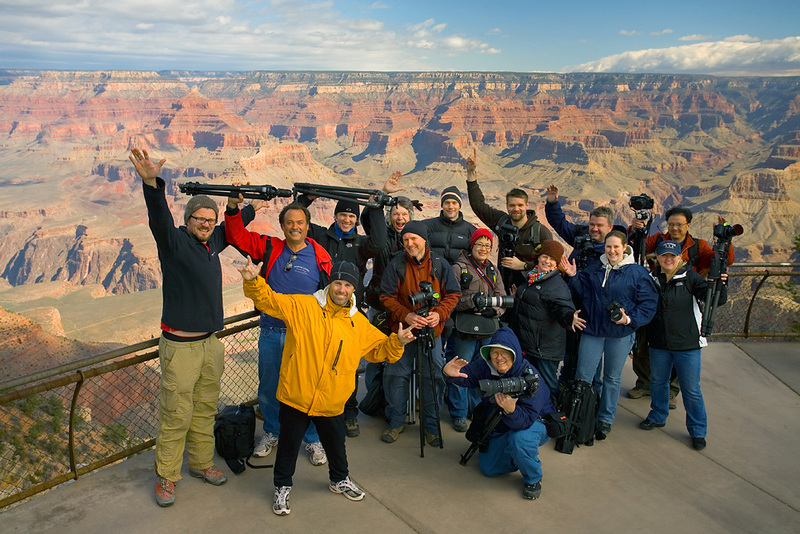 The morning was chilly, and a sleepy but eager group met and loaded up into the warmth and comfort of the ApCab for the long drive to the Navajo Nation in Page, Arizona the location for the duration of our first day of photography. 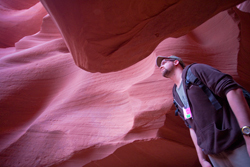 Antelope Canyon is out of this world. When people see images from the canyon it doesn't seem real. The lines, textures, and colors are so intense and different that it looks like something from another planet. Speaking from experience, we know the feeling when you first approach the entrance to the canyon…a very narrow crack in the red rock of the desert. It wouldn't appear that anything was in the area. Upon descent into the canyon the world changes and you enter a world of light and texture unlike anything you can imagine. 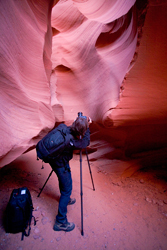 Slot Canyons are formed over considerable time by the movement of wind and water over the sandstone, which leaves behind a smooth curvaceous landscape. These curves take on the light filtering in from the narrow top of the canyon and create a vivid display of reds, oranges, and yellows that rival the best paintings. 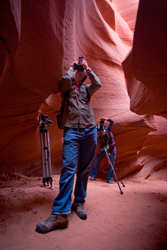 It is this that brings photographers to the canyon. Due to the narrowness of the canyon, our group split into two smaller groups and worked inwards from opposite ends of the canyon. 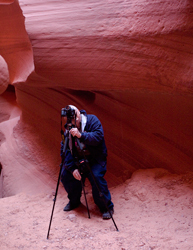 The Instructors worked with students on how to use the curves as leading elements in their images, how to adjust white balance to bring out the best in the colors of the canyon, and how to see images in the smaller details of the nearly 200ft canyon walls. When they weren't working with the class and helping them see possibilities, the instructors would throw sand in the air to help accentuate the rays of light as they filtered in to the depths from above. Students even got in on the act of sand throwing as well….even if a bit did land on Kevin's head. Hey, Practice makes perfect. 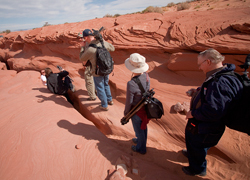 The first hour, the instructors kept close tabs on the group, but as the class became more comfortable with the types of settings they needed, they eagerly spread out on their own to explore the canyon, and take in their cool, quiet, surroundings alone. 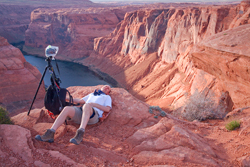 Time flies, and after three plus hours in the canyon people were getting hungry, and needed a rest. 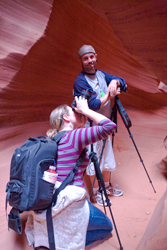 Everyone left the canyon excited about the images they'd captured, and agreed that it was beyond what they'd expected and that they could've spent all day in the canyon. Those who had been there before, saw new areas that intrigued them, and made the most of seeing things in a different light. Lunch was great, and the group enjoyed some of the Southwest's authentic Mexican cuisine before heading out again for the next location…HOODOO'S! A few miles into Southern Utah the landscape begins to change again from the primarily red-rocked landscape of the Page area. 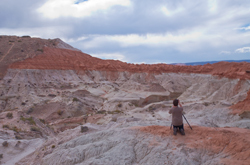 Southern Utah is Hoodoo country, and just a mile into the toadstool trail lay some of the area's most interesting and bizarre rock formation. 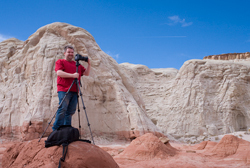 Upon arriving to the towering white rocks topped with reddish-brown helmets someone always asks, “Are these real?” Yes. Nature has sculpted an area that is as visually bizarre as it is interesting to photograph. 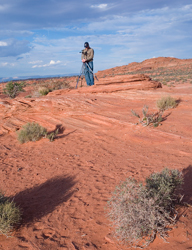 The group spread out over the area and Kevin and Brian worked with them to find strong foreground elements to create balanced, aesthetic, compositions. Students did amazing and some of the weekends' best images from this unique area. Whether it was a curve in the land, or an old yucca plant the students made the most of the area and walked away with some tremendous work. After a brief stop for snacks at a Page gas station it was off for the final location, Horseshoe Bend. 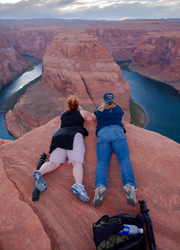 Horseshoe bend is not only one of the Southwest's most iconic and amazing locations to photograph, it's also a test in overcoming one's fear of heights…or in the case of some (instructors included) it's a chance to show your human side and let everyone know you're not a fan. The bend is an almost perfect horseshoe shape, which needs to be captured in full to really appreciate the magnitude of the scene, and eliminate some of the distractions of the edge of the cliff. 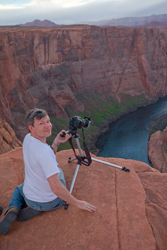 To fully capture this shot it requires being at the edge. There is an obvious safety concern here, and the instructors, while quick to joke and have fun take this part very seriously and let the class know they need to proceed with caution, and laying down and staying away from the edge as much as possible is required. 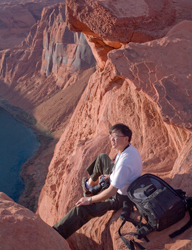 They even offer to take a photo for the students if they are too nervous to get to the edge. The beauty of this place is still evident even if you opt not to sit out on the cliff. The group battled a strong wind and vicious blasting by sand as they stood their ground along the edge, and waited for what they hoped would be a glorious sunset. 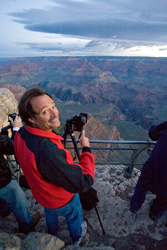 Urged on by an enthusiastic Kevin McNeal and a very much petrified Brian Rueb a glorious sunset DID arrive and the class joyfully shot the bend as well as the surrounding landscapes. Brian even made it out to the edge to frightfully pose with some of the students, and capture a shot for one of the students who wasn't able to make the hike out. When the sun finally set, the class made the walk back to the ApCab and made the drive back to the hotel. Even though the drive was long, it was spiced up by a tremendously funny group of students who kept everyone entertained, albeit a bit disturbed by having Ace of Base songs stuck in their heads for what ended up being the rest of the trip. The second morning comes even earlier. We leave the hotel at 5:30am so we ensure we'll arrive at the Grand Canyon in time for sunrise. 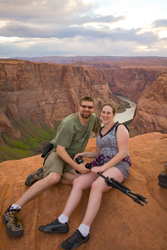 Yavapai look out is a great place to see the canyon, and has enough area that the class can spread out a bit and look for portions of the canyon that really speak to them in terms of their composition. It also has some nice railed areas, which helps anyone who has a fear of heights. The clouds this morning were in all the right places, and the sunrise was very pretty. 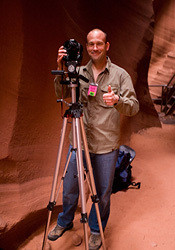 The instructors worked with the class on vertical compositions as well as horizontal. 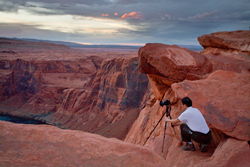 Many people photograph landscapes horizontally and have difficulty switching to vertical…and the instructors are skilled in being able to help see in both directions which helped the students by giving them more options. This place was also very good for working with split grad filters. Filter use is a mystery to many, and these workshops spend a lot of time showing students how to use the filters, and the many ways that they can really help bring out colors, or balance exposures. With a good sunrise under our belts it was time for a break, and the class went back to the hotel for a bit of downtime before meeting back up with the instructors in the lobby to go over a bit of workflow management and answering of post processing questions. 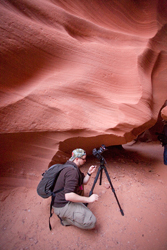 Brian and Kevin have very different methods for post processing, as do most of our instructors. It's good for the students to see how professionals handle images, as well as learn a valuable lesson: There are many roads to take that ultimately end in the same location- A beautiful finished project. 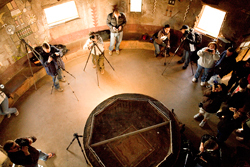 Whether it's a bracketed shot, or a single exposure there are options when it comes to making a finished image and our instructors are extremely good at this vital step in photography. Light bulbs came on in the students as many picked up new methods, or tips that would help them in their processing when they returned home. The afternoon shoot was back in the canyon. Desert View is a lovely location, while waiting for the sunset the class spent time in the old tower, which is very photogenic itself! Students sat on the floor, set timers, and made the most of the warm light in the tower and the many nice geometric patterns. For instructors it was a chance to work on composition, aperture questions, using white balance to maximize the tonal qualities of the room, as well as have some fun with a group shot. 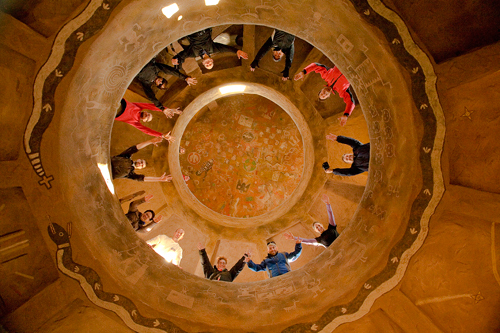 90% of the class was at the tower and we made a fun group shot which required a bit of running by instructor Brian Rueb in order to be in the image. In addition to this being an interesting photograph, it goes to show that having fun is a big part of what we do here, and it's what photography is all about. Sunset that night wasn't as spectacular as the previous night, but seeing the Grand Canyon in any time of day, under any condition is always amazing. 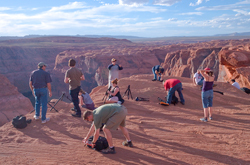 The lack of clouds gave the instructors a chance to work on close up shots that showed the layering of the canyon as it faded out into the horizon. These close up, intimate shots often times are as interesting as the large scale images. While the Grand Canyon was very nice with light and clouds for the duration of our stay, it fought us a bit with cold and wind…which took its toll on the group. When the sun set, the group was ready to hit the road and get warm. We loaded up the ApCab and set off back to the hotel. Once back in Tusayan the group left the ApCab and set off. Many went to have dinner together in the hotel before setting off back towards their respective homes or continue on in their trips to other fantastic locations. The group had come together that weekend and seen some amazing things. Whether their trip ended that night, or continued on…one thing was for certain. It was Grand. Brian, Kevin and the rest of the crew at the Aperture Academy.